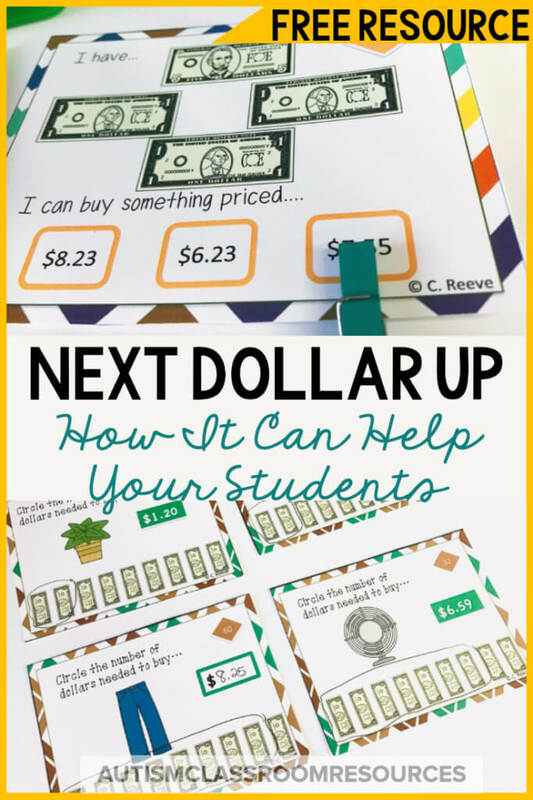 The Next Dollar Up strategy is a great way to help students who can’t make change be able to make purchases independently. I love to use it for students in life skills. It’s important that students have an understanding of money in order to avoid embarrassment and potential temper tantrums when they don’t have enough to buy what they want. What is the Next Dollar Strategy? It’s very simple. You look at a price (say $1.50) and you give one more dollar than the number of dollars in the price (you give $2). So, if you want to buy something that has a price for 4.50, you give $5 and get back the change. Easy Peasy. 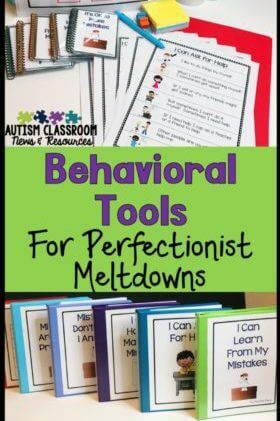 Have you ever had a student who has a meltdown when he can’t have something that he wants? Imagine that a student wants the newest X-Box game that costs $30, but he only has $25. I’ve had students in this situation who would have a meltdown at the cash register because they figured they had money but didn’t realize it wasn’t enough money. This means they can grocery shop, shop for clothes and other important tasks without supervision or with less supervision. And let’s face it, even if they still need supervision, every thing that they can do independently is a huge win for their self-confidence. Is teaching making change important? Of course it is. And if the student can master this skill, then you should definitely teach it. However, some of our students have 1-1 correspondence but difficulty understanding the denominations of coins, next dollar up allows him to still buy things independently. And let’s face it…we don’t all count our change. We know we should and we have a general idea of what we should get back, but we don’t always count every penny. So, we shouldn’t hold our students to a higher standard than we have. How Do We Teach Next Dollar? In order to teach the Next Dollar Up Strategy, the student has to have 1-1 correspondence in counting. So that is our first step to teach. 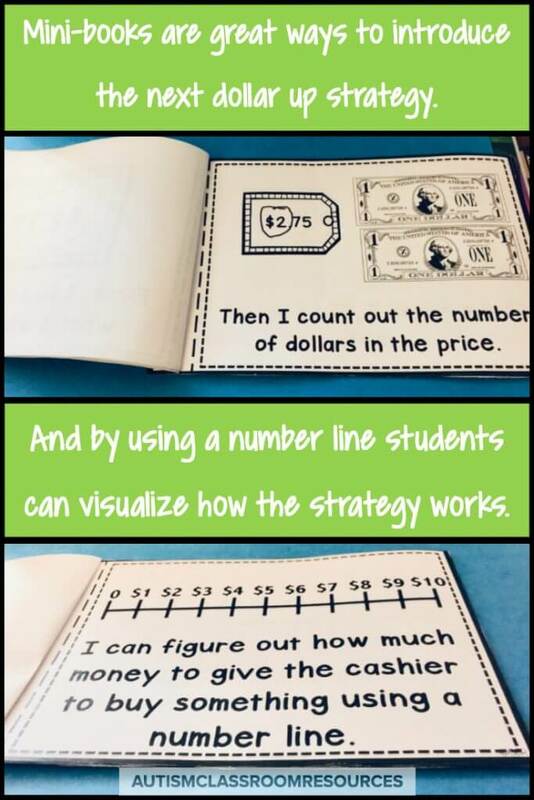 And for older students you can start that teaching by working on counting with $1 bills. Like with many things, I start teaching it by introducing the concept through books or discussions of how it works. I like using these mini-books from my Interactive Next Dollar Instruction Megabundle. Then I use a step-by-step task analysis to teach each piece of it from counting, to counting one above to actually making the purchase. To see more about these teaching programs, check out this post. And then, students need to practice. I like to practice in multiple ways. First, I build it into their instructional time by having them earn dollar bills and make purchases from a reinforcer store with prices on them. I like them to practice actually counting out the bills, particularly at first. And of course you can and should build it into any community-based instruction that you do, having students make purchases using the next dollar strategy. This helps to generalize the skills. Finally, I like students to practice and I am always looking for ways to build it into independent work to practice. Task cards and worksheets are great tools for doing this. In this set of task cards, students circle the price of something they can buy given the number of dollars. 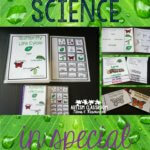 The cards include combinations for $5 and $1 bills to a total of $9. These are similar to looking at a sale flyer and or price tag in a store and determining if you have enough money in your pocket to afford it. Twenty cards require answers for what can be bought (based on money given and prices). And 20 more require higher thinking to choose the most expensive thing you can buy with that amount of money. I did this because in the first set, the answer will automatically be the lowest number on the card. If your students are savvy enough to pick up on that, then the second set will work better for them. If not, then the first set works and the second might be a challenge. You can find the same type of task cards in Next Dollar Up: App Edition. Click the picture to grab this product. How Many Dollars? 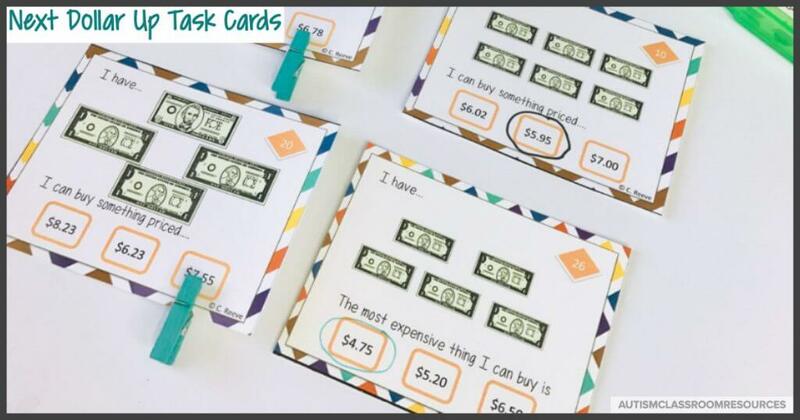 Task Cards require the student to determine how many dollars are needed to make a purchase. Like the cards above, each card has a product or app to buy with a price tag. Then, the student circles the number of dollars needed to make the purchase. This strategy is used in the How Many Dollars Task Cards, the How Many Dollars Department Store, and the Next Dollar Up App Edition. Worksheets are another great tool for practicing independently or with some assistance from staff. 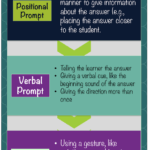 Like task cards, they make a great tool for paraprofessional centers. And when they are mastered, they are easy tasks for independent work systems with low prep. 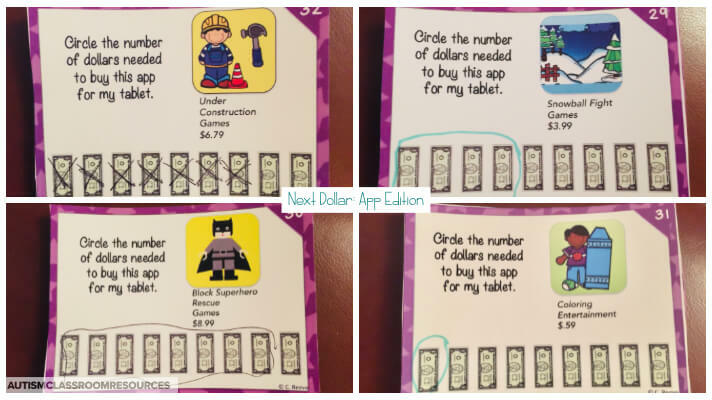 Next Dollar Up Worksheets has 10 black and white worksheets included. There are 3 worksheets with amounts to $5 and 7 worksheets with amounts to $10. And I included a number line on the worksheet for the students to use to count. 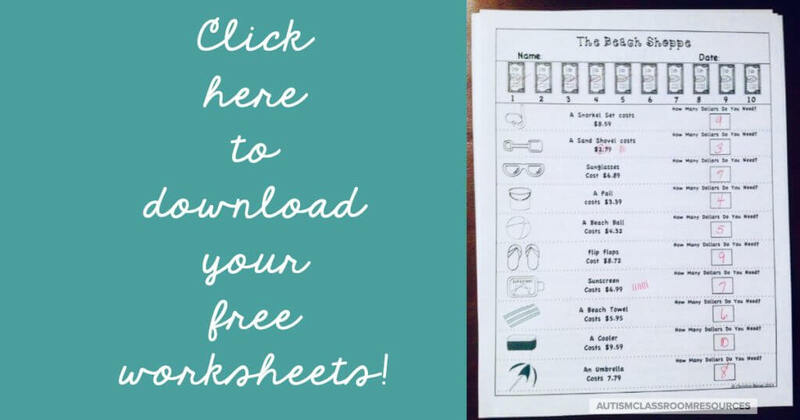 And so that you can try them out, I’ve included 2 FREE worksheets you can download here. Did You Know the Special Educator Academy has a whole workshop on teaching money skills…and lots more? Click to find out more. I meant to say…Thanks for sharing! I love these materials. They will be helpful to a couple of my students, too! So glad they were useful! Thanks for stopping by and commenting!! Love your blog! Thanks for sharing, I had never heard of the Next Dollar Strategy. So glad you found it–it's so simple and yet so useful! 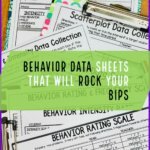 Your worksheets were exactly what I needed to get the ball rolling – thanks so much!! If you are using iPad or iPhone our Next Dollar UP app is available on the iTunes appstore. Thanks Wade. I have been trying to get around to trying that out to write a review; just haven't had the time! Your materials are fantastic. I'll be sharing this site with friends. Thank you for these wonderful resources. They’re perfect for my students. I love this, but this could be difficult if there is tax added. That can be a problem, but it will work either way with totals given by the cashier and will work unless tax takes the purchase over the posted dollar amounts.